A group of paramedics and EMTs are training to provide better care when there's an active threat. After 1 October, paramedics and EMTs quickly realized there new kinds of threats they need to prepare for. A group of paramedics and EMTs are training to provide better care when there's an active threat. After 1 October, paramedics and EMTs quickly realized there new kinds of threats they need to prepare for. That's what the Tactical Emergency Casualty Care Course by Community Ambulance is all about. Dozens of first responders joined the weekend-long training. Daniel Webster, is an advanced EMT. "I spent six years in the army as an army medic so I have a little bit of background with this. After the 1 October attack I felt it would definitely be a good idea to refresh everything and learn the differences military vs civilian health care." The course based on military combat trauma care teaches emergency medical practitioners how to care for patients to decrease preventable deaths when there's an active threat. "We're a little more aggressive in handling things. We're a little more aggressive in taking care of people in a more timely manner. Following 1 October, Community Ambulance has also done "Stop the Bleed" classes for the public -- teaching people how to prevent trauma deaths with effective bleed control. The private company provided medical coverage at the Route 91 Festival -- responding from within when bullets started flying. Community Ambulance is the only site authorized to hold this weekend's advanced emt training. Glen Simpson, is with Community Ambulance. 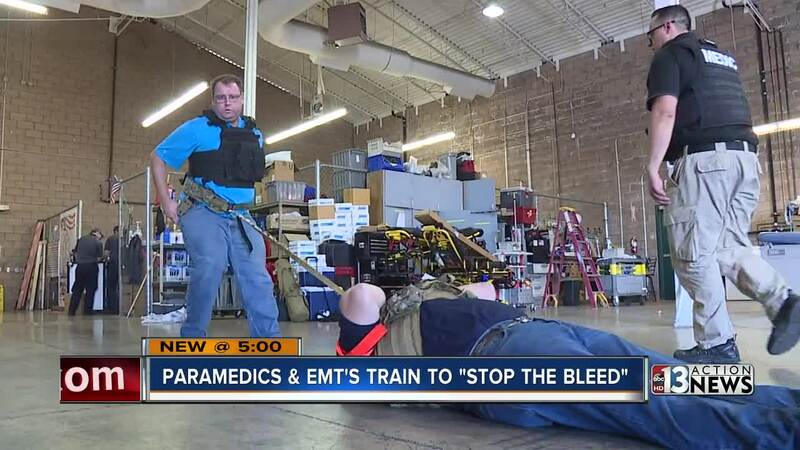 He says, "Paramedics and advanced EMTs are here to take some of the applications that are used in the military and applying them to a civilian world." And of course part of the training -- how paramedics and EMTs can protect themselves in a hostile environment while trying to save others. It's a risk they knew as part of the job but it has become more pronounced now more than ever. "We're here to serve others. We're willing to take that risk so everybody else can go home and see their loved ones and see their families," says Webster.